We want to be legal and do this right. So I'm coming to FontSquirrel for the first time. Seems to be lots of free fonts and there's often a globe symbol which seems to say the font is free for web use. So we download the font and we get a set of TTF files. But we need to have the webfont files, EOTs, WOFFs etc. And, hey, FontSquirrel offers a big button where you can make these. You hit the button, you say yes to "is this legal" (cos it seems to be, see above), you reupload the TTF you just got from FontSquirrel and pretty soon down come those webfont files. All this is fine, and my question is going to sound lazy, and I don't mean it to. But why don't FontSquirrel just hold the webfont files as well and why don't they just give the whole lot to you when you first download? Or at least offer them - I get that there are print designers etc who don't need webfonts. Is the reason anything to do with the legality or otherwise of us now proceeding to deploy those fonts on a commercial website? NB in this question the asker has obtained a copy of a commercial font from somewhere else and has tried to use it with FontSquirrel's generator. Informative and helpful answer. But in my case I've obtained the font from FontSquirrel themselves, so different question I think. From what I understand, the ability to use fonts on websites is at the discretion of the font's license. 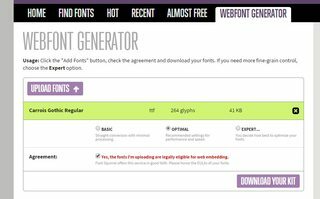 For some licenses you are able to modify fonts whilst also being able to redistribute them, hence why for some fonts on Font Squirrel they offer a Webfont Kit allowing you to download a variety of fonts. To make things a little easier if we take a font licensed under the Creative Commons - Attribute 2.0 license such as fontsquirrel.com/fonts/Aaargh, a Webfont Kit of all the available formats is made available. The reason for this availability can be seen in the cited license: https://creativecommons.org/licenses/by/2.0/uk/. The Creative Commons - Attribute 2.0 license makes it clear that you are able to share the font in any medium or format. "Original or Modified Versions of the Font Software may be bundled, redistributed and/or sold with any software, provided that each copy contains the above copyright notice and this license." I can only assume that providing you also upload the font's license and its copyright notice to the website you wish to use the font on it is perfectly legal to use. This is the best answer I can provide for this question, however I would think it wise to wait until someone can cite my sources before you go ahead using the font. Not the answer you're looking for? Browse other questions tagged legal fonts or ask your own question. Tahoma, Verdana, Trebuchet, Georgia, etc as webfonts? Would a long article using SVG rendered letters (rather than a font) be performant (usable and scrollable)?